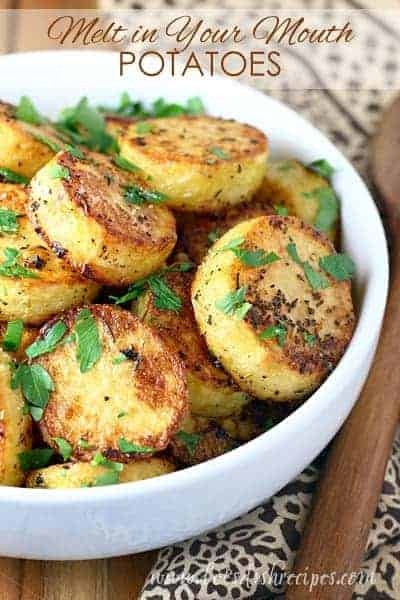 BROWNED BUTTER ROASTED POTATOES — Browned butter and a hint of sugar give these roasted potatoes an extra special sweet and nutty flavor that everyone will love. The perfect side dish for any meal! If there’s one thing I can always count on when I’m making dinner plans, it’s that a potato side dish will be a big hit. 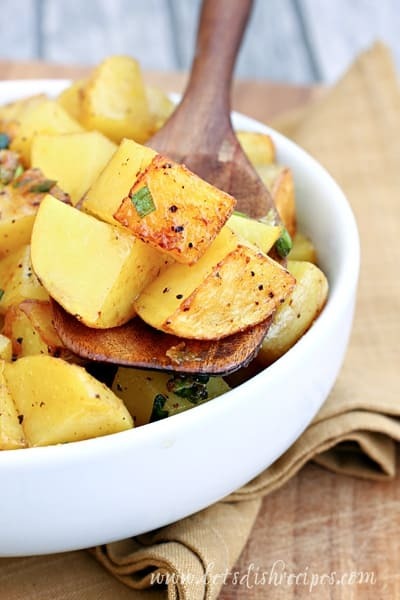 And these savory and slightly sweet Browned Butter Roasted Potatoes were no exception! I started with Yukon Gold potatoes, and although you could use another variety, they were absolutely perfect for this dish. 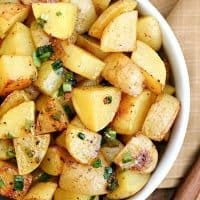 Add some browned butter, a touch of brown sugar, and a sprinkling of green onions and you’ve got a potato dish from heaven! I love sweet potatoes, but most of my family doesn’t, so this dish, with just a hint of sweetness, was a perfect compromise. Next time I’ll double the recipe, because everyone went back for seconds! And if you’ve never browned butter before, don’t worry, it isn’t hard. You just have to keep an eye on it, because it can go from golden brown to burned in a matter of seconds. Honestly, I never thought I’d say this about a potato, but they’re almost too pretty to eat. I mean, just look at that beautiful golden color. Actually I ate quite a few. And this recipe has me thinking about how wonderful it would be to pour browned butter over all kinds of roasted vegetables. That’s definitely a post for another day. And even though this seems like an extra-special side dish, it was super easy to make. Best of all, my whole family loved it. 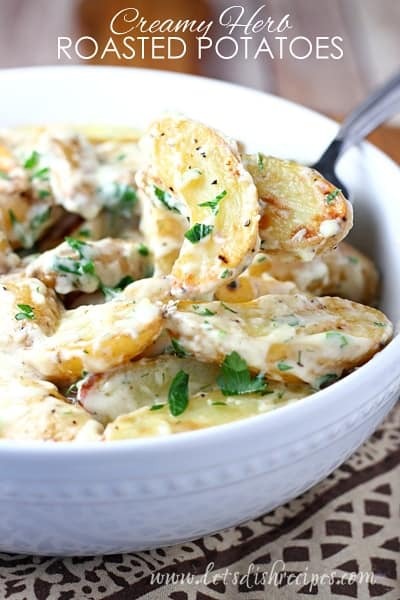 We’ll definitely be making these potatoes again and again! 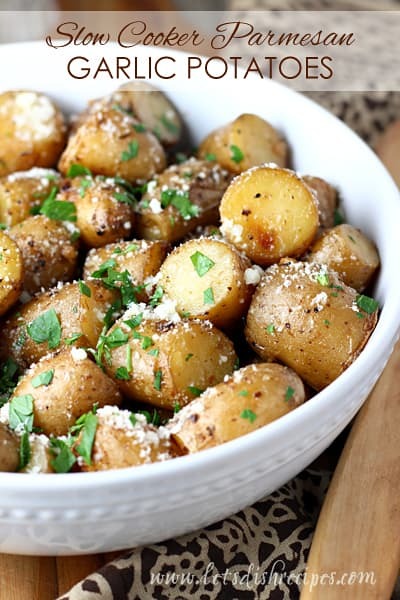 Be sure to save this Browned Butter Roasted Potatoes recipe to your favorite Pinterest board for later. Preheat oven to 425 degrees. Place potatoes in a large, shallow baking pan. Drizzle with olive oil and sprinkle with garlic salt and pepper. Toss to coat evenly. Roast, uncovered, for 20 minutes. Meanwhile, in a small saucepan, heat butter over low heat until melted. Continue cooking until butter turns a light golden brown and has a nutty aroma. Remove from heat and set aside. Remove potatoes from oven. 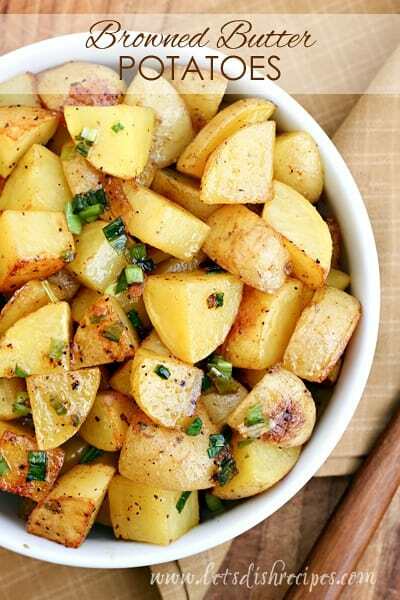 Pour the browned butter over the potatoes and sprinkle with brown sugar and green onions. Stir to coat potatoes evenly in the butter and brown sugar. Return to oven for an additional 15-20 minutes, or until potatoes are tender and golden. Season with salt and pepper, if needed, before serving. This looks so yummy! How much brown sugar do you use? I didn’t see it in the ingredients list. I’m thinking like a tablespoon? Thanks! Oops! Yes, 1-2 tablespoons, depending on how sweet you want them.